Like bidding on the game show The Price is Right, you want to bid as close as possible without going over. That’s because during scoring you are given ten points per trick you bid, and an additional point for every trick over. If you expect you can take four tricks and you get five, that’s worth 41 points, but if you “break contract” by taking fewer tricks than you bid, you get 0 points. You can also bid “Nil,” which means that you think you can avoid taking any tricks (either because you have low cards or no spades). Going nil is definitely the most nerve-wracking way to bid, either in a regular game, or a partner spade game! The three main factors when deciding how to bid in spades and partner spades is to count your high cards, see what trumps you have, and suit length in your hand. Having a few queens is not nearly as good as having a few queens and also an ace and king to ensure that, barring someone taking a trick with a spade those are virtually guaranteed tricks for you. Unless, of course, your suit length is quite high. If you have seven diamonds including a Queen, King, and Ace, you can’t necessarily count on those all being tricks, considering there are only 13 of each suit in the deck—you’re bound to have some of those high counting cards get swiped by a spade! Newbies learning how to play spades often engage in some simple gambling methods that may sound reasonable, but are a very bad idea strategically! One such example is advice often given to new players to “bid the number of spades you have.” Of course if you play different variations, like mirror spades this is the rule and not a bad strategy. But in general, that is a terrible strategy to engage in with no caveats. Even if you have a very high spades card like the Queen of Spades. If you don’t have the King of Spades, the Ace of Spades, or even a handful of lower spades to be able to throw away if someone plays those higher-value cards, then your Queen of Spades is not a guaranteed point, but may in fact be drawn out and wasted when someone plays a bigger spade. Same with even your King of Spades if you’re lacking the lower spades. Often people will say “every Ace and every High Spade.” This is a slightly more effective approach. If you have a decent amount of spades and hardly any of a different suit of card, provided the others are fairly evenly distributed among your competitors, you can then more reliably assume that at least half of your spades have a good shot at being tricks, along with any other trumps you have. Beware of overly optimistic 5-6 trick bids unless you have a stellar hand, as well as pessimistic low bids that may load you up with bags. 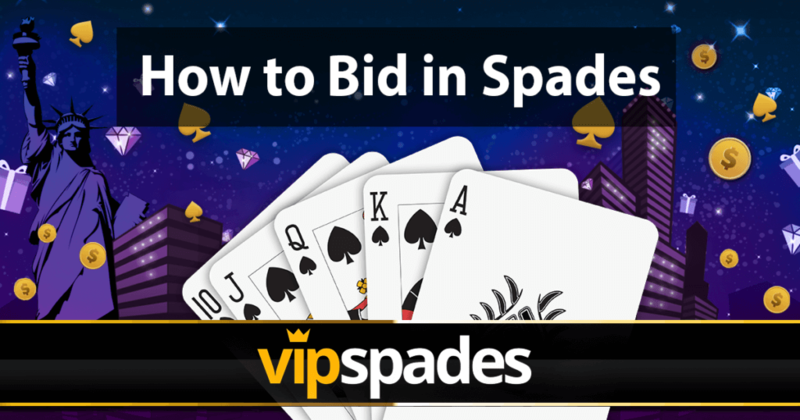 To make Spades a little more interesting and punish the timid, your additional points over your bid are called “bags,” and once a team reaches 10 bags, they receive a 100 point penalty, and then their bags are reset to zero! A punishment to those who play it too safe, and a potential saving grace for someone who might have gone negative in a round or two. Schadenfreude is a strong emotion, and one can’t help but engage in a bit of it when forcing a player who has bid nil to take a trick they clearly thought they were going to avoid. Only bid Nil if you really think you can navigate your hand (or a blind Nil if you’re really ballsy) and that it is really the calculated risk you want it to be. Going nil can be an effective way to slingshot back into a lead after too many bags or going under on too many hands. It can also be an easy way to go into the negative!